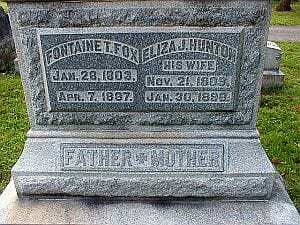 Fontaine Talbott Fox Sr., Bellevue Cemetery, Danville, Ky.
Born in Liberty, Missouri, Charles Bruce Younger Sr. was only twenty-three when he took a stab at killing the political campaign of his older cousin, Fontaine Talbott Fox. Their cousins in the future Younger Gang were yet in their teens. Fox was a politically savvy old codger. Already in his fifties, he had been a lawyer, judge, and attorney general for Kentucky. He had weathered two successful elections to the state legislature. Fox had muscle and political pull. 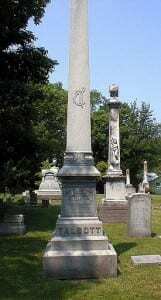 His father Will Fox was a long standing court clerk, securely installed in his position when he was only sixteen or seventeen by John M. James, the grandfather of Frank and Jesse James. Regardless, Younger was determined to take Fox down. Fox’s challenger was Albert Gallatin Talbott Sr. An attorney, Talbott received his law education from Samuel Hughes Woodson, an eminent Kentucky lawyer who later turned notorious for fixing elections in the Missouri-Kansas border wars. 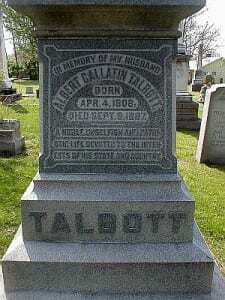 As a Democrat, Talbott was an abolitionist. Seeking another term in the legislature, Fox, who formerly was elected as a Whig, had drifted into the opposition No-Nothing Party. No-Nothings were strictly anti-immigration. They supported only native-born candidates for public office. On a religious platform, the No-Nothings were also anti-Catholic. As a boy, Charles B. Younger served in the Liberty Company of Missouri Volunteers at Fort Leavenworth under Alexander Doniphan, preparing for war against Mexico. When Doniphan went to war, Younger went to St. Joseph’s Catholic College in Bardstown, Kentucky, to pursue an education. His father, Coleman Purcell Younger, had converted to Catholicism, in respect of his wife’s faith when they married. Both father and son were Democrats. Albert Gallatin Talbott, Bellevue Cemetery, Danville, Ky. When Albert G. Talbott contested Fontaine T. Fox, Charles B. Younger had just arrived in Danville, Kentucky to complete his senior year at Centre College. Two years behind him was Thomas T. Crittenden, who later would plot to kill Jesse James. Younger became Talbott’s campaign manager. Albert Gallatin Talbott, inscription. Bellevue Cemetery, Danville, Ky.
C. B. Younger defeated his cousin Fontaine T. Fox with a blast of words. Writing repeatedly in a Danville Democratic newspaper, Younger dismantled Fox piece by piece as the candidate with no solutions to serious problems. Younger won the election for Albert G. Talbott. Later when elected to Congress, Talbott took on the serious problem of avoiding civil war. He urged the surrender of slaves in the South to the United States for fair compensation. Charles B. Younger became a lawyer. He removed with his father to San Jose, California, where the two practiced law, settling disputes among Anglos, immigrants, and Mexicans. His mediation in the Soquel Rancho dispute led to the founding of Santa Cruz. The junior of C.B.Y. Sr, as he came to be called, married the daughter of Augustus Hihn, a wealthy German immigrant. Working together across European, American, and Mexican cultures, the Youngers became wealthy representing Hihn’s financial interests. As his cousins in the Younger Gang sided with the James Gang, C.B.Y. faced his most delicate circumstance. On behalf of Augustus Hihn, Younger foreclosed on the town of Paso Robles, California, developed and owned by Drury Woodson James, the uncle of Frank and Jesse. Hey, Arizona…We don’t need no stinkin’ “papers” !